Just look at this fresh green color! I just love it! It makes me so excited for spring! I put 25 of these centerpieces together for a St. Patrick’s themed church party. I was asked to be over the decorations, and I didn’t have much of a budget to work with. 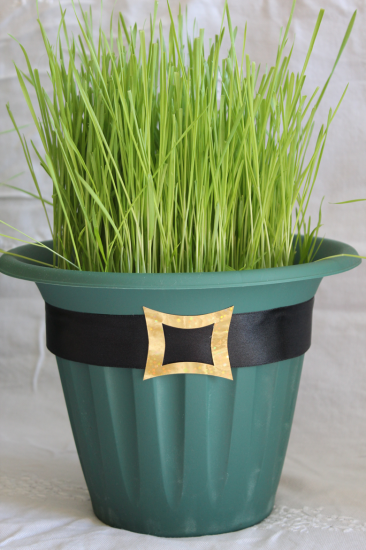 The idea of wheat grass centerpieces came to mind, and I knew it was just the idea I was looking for. 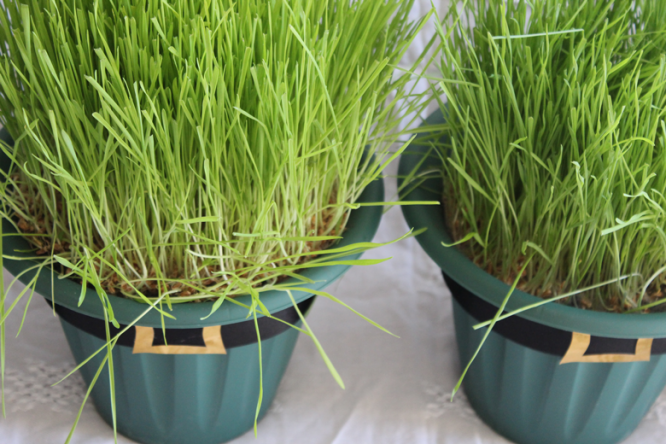 For one, wheat grass is super cheap to grow especially if you happen to have bulk wheat berries on hand (which I always do to make this bread!). Secondly, it doesn’t take much time – a week and half, two weeks maximum. AND, the grass is so bright and fresh looking – just the color pop I wanted! I found the planter pots at the Dollar Tree. I was so excited they were green and resembled leprechaun hats! To plant the wheat grass, I basically followed these directions. The grass grew so fast! My kids and I had a LOT of fun watching it grow from day to day. To finish the centerpieces off, I hot glued black ribbon around the brim of the hat and added a gold paper buckle. I am so pleased with how they turned out. 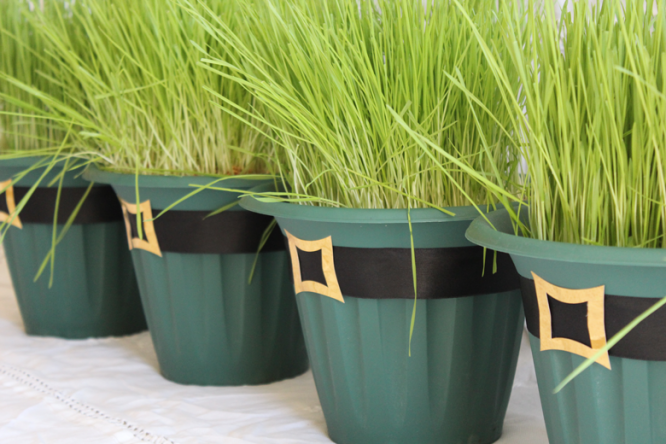 It may be too late to grow wheat grass for St. Patty’s Day, but wouldn’t these be cute with a colorful polka dot ribbon for Easter with maybe some eggs peeking out the top? Oh, the possibilities! You really should try growing your own sometime. It’s quite fun! With spring around the corner and St. Patty’s Day fast approaching, I’ve been eyeing bright rainbow cakes all over the web. I made 40 of these cuties for a church event last week. 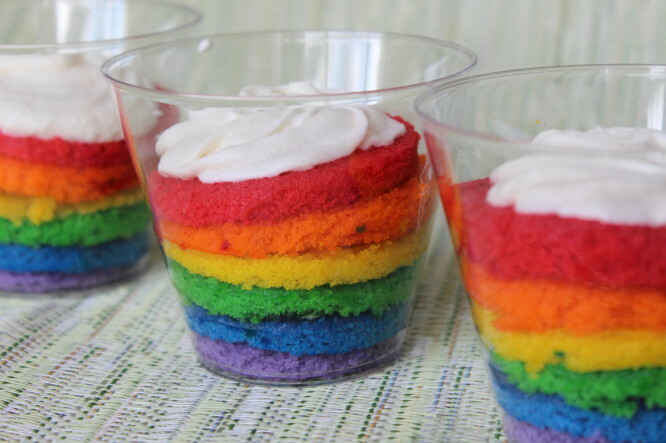 These individual rainbow cupcakes added so much color to the evening, and they were delicious. This white cake recipe is scrumptious when combined with a lemony Swiss meringue buttercream. Served in clear plastic cups, the individual servings were perfect for a buffet table and would work at any party or gathering. So cute, you must give these a try! Preheat oven to 350F degrees. With parchment paper, line how ever many 9×13″ pans you have. I have three and just reused them. Cream the sugar and butter, then add the egg whites and add them a little at a time. Add the vanilla and mix until fully incorporated. Then, alternating between wet and dry, add the milk and flour mixture in two parts. Divide the batter amongst 6 bowls (It’s about 1 c each), and then whisk a fair amount of the appropriate food color into each bowl. Keep in mind that the color of the unbaked batter will be the color of the baked batter. Pour into the pans – the batter will spread to be quite thin. Bake for 10 minutes each. When you remove them from the oven, let them rest on the cooling rack, in the pan, for ten minutes. Then flip, cover, and stash them in the fridge to cool quickly. To make the Lemon Swiss Meringue Buttercream, cook the egg whites and sugar in a small saucepan over medium heat, whisking constantly, until the sugar is completely dissolved (test by rubbing some between your fingers. If it’s completely smooth, it’s done). Pour into another bowl (a stand mixer is preferable) and whip on high speed until room temp. Then, on a medium-slow speed, add the butter, waiting until each piece is completely incorporated before adding the next. After all the butter has been added, turn the mixer back to high speed and whip until it has come together, about five minutes. Add the extract, beat briefly and then use. Using various sizes of cups or circle cookie cutters, cut 10 circles from each color of baked cake. Use the smaller circle for the bottom purple layer and use gradually larger circles for the layers on top. Place purple circle in the bottom of a plastic cup, and put a dollop of buttercream on top. Repeat with other layers. Pipe frosting on top layer.